Among the vintage interior design trends, the mid-century modern designs of the 1950s are holding fast. TV shows like “Mad Men” seem to have struck a chord with many yearning for the days of simple style, cleaner lines and just a hint of frivolity. While many think of the 1950s as the “good ole days,” times were not as simple as the designs which would come out of this “atomic” era. 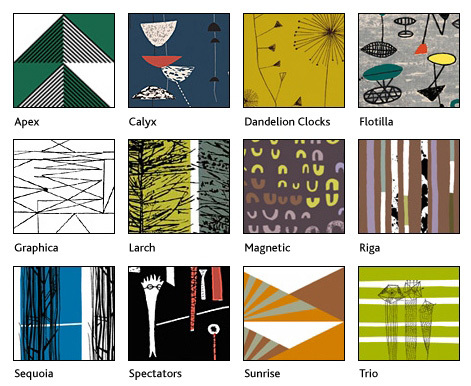 Full Swing Textiles has a complete line of 1950s retro real “barkcloth” fabrics with names such as “Mid-Century Modern-Coral” and Lake Sebago- Black. The rough, bark-like texture of the 100% cotton crepe weave cloth is produced exclusively for Full Swing in a U.S. textile factory. Image via Full Swing Textiles. The Centre for Advanced Textiles’ gallery of reproduced textiles by 1950s designers Lucienne Day, Robert Stewart and Sylvia Chalmers. Image via The Centre for Advanced Textiles. 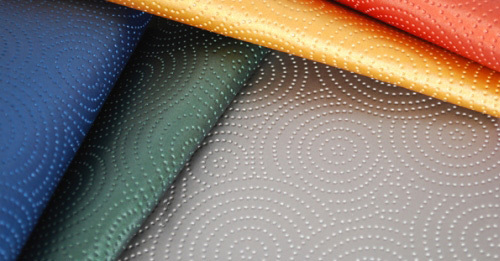 Kravet’s Sta-Kleen performance fabric is a throwback to the 1950s formaldehyde resin fabrics, with its faux leather feel, raised circular designs and availability in five bright hues. The 1950s saw the rise of American pop culture amongst the backdrop of economic expansion, nuclear anxiety and social conservatism. With the restraints of the new conservative nature of the times, furniture and textile designers were taking their cues from the uprising of the younger generation who were participating in a rebellion of their own. The designers were working hard to create a new home which gave its owners simplicity in every form but amongst a dynamic-hued palette. The modern design schemes came in the form of space-age colors such as bright red and gold, blue and green, Scandinavian harvest gold and avocado green and also soft pastels of pink, light yellow, sky blue and turquoise. Black and white checkerboard floors and white or brightly colored walls were a popular backdrop to show off the new colors. Furniture designers were giving the public organic fluid designs in the forms of the Tulip Chair from Eero Saarinen and Charles and Ray Eames with their innovative materials such as fiberglass, plastic resin and wire mesh made chairs designed for Henry Miller which are still in production and popular to this day. Teak was everywhere as a result of America's love for the influence of the Scandinavians. The Korean crisis stepped up military requirements while the new designs upped civilian requirements for textiles and sent the volume in American cloth production to booming proportions in 1950. The New York Times reported wool prices reached peak numbers, cotton goods had the biggest output since 1943 and rayons were in more demand than ever before. Out of this came a textile revolution. Textile manufacturers flooded the market with new colorful, organic textile designs of the 50s in bold barkcloth patterns, simple gingham prints and popular kitchen prints. Today, we are seeing a rebirth of these textile designs in answer to our own reaction to the societal and political crisis of recent years. Heimtextil Trend 2010/2011 reported “an explosion of good humor and bright colors” would hit the scene in 2011, they call it a “Uni(re)versal.” The Centre for Advanced Textiles reproduces and sells many of Lucienne Day’s designs from the 1950s along with the designs of two other noted designers Robert Stewart and Sylvia Chalmers. 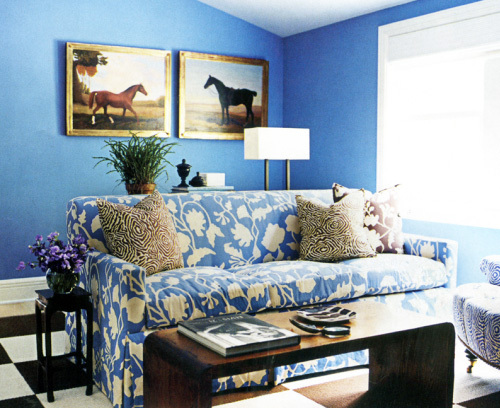 Although each unique, all of their fabrics have an optimistic feel to them. 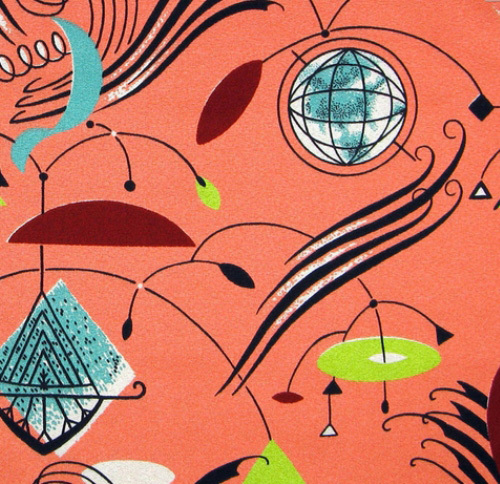 Interested in modern textiles? Check out Dwell's Made in the Shade design competition!